SALT LAKE CITY — On Thursday, July 17, Salt Lake Community College’s (SLCC) South City Campus hosted the first annual Bearfoot Music Festival. An event organized by SLCC’s Resonance club, Bearfoot Music Festival broke ground with an evening of energetic music and an array of family fun and games. Patrons danced the day away to live music, while others brought lawn chairs and blankets to relax on the grass beneath the shady trees lining South City’s east entrance courtyard. 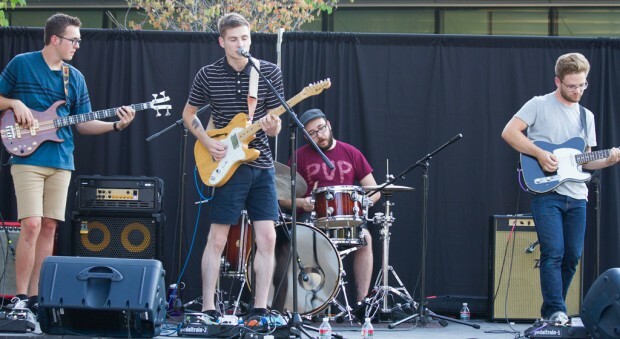 With the east main entrance of the South City Campus serving as venue for the event, Bearfoot Music Festival provided a diverse selection of music, featuring sounds by local artist groups including Band on the Moon and Great Interstate. Many performances included covers and original works by student musicians at SLCC. Family-friendly activities ranged from chalk drawing, face painting and caricature art to games and contests, including a shoe toss, an air-guitar duel and a kiddie pool filled with ducks for children to fish out. Activity participants received prizes such as small toys and treats. 20 minute tours of the new Center for Arts and Media facilities were also available during the festival. Booths featured at the event included 24-Hour Fitness, 90.9 KRCL and the SLCC Student Association (SLCCSA). Local catering business Surefire Pizza’s fresh authentic Italian wood-fired pizza was available for purchase throughout the length of the event. Festivities began around 4 p.m. that day, and continued on through the warm summer afternoon, eventually ending at approximately 8 p.m. Although this year’s attendance was somewhat sparse, Bearfoot Music Festival left participants with a relaxing summer evening well spent and a glimpse into what could become an exciting new tradition for Salt Lake Community College.